Newbrough WI was founded in 1923 by over 100 ladies from Newbrough, Fourstones and the surrounding area. They originally met in the Town Hall until 1945 when they were given WI House, previously the Mechanics Institute. 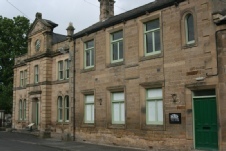 The WI donated the building to the Town Hall in 2000 as part of the millennium project. Talks given in the early years were for example; how to truss a fowl and how to re-upholster chairs. Entertainment was provided by members singing or performing plays among other things. Nowadays we still have talks but we buy our fowls already trussed!! Newbrough WI have taken part in WI County events and competitions over the years and indeed have been privileged to have two County Chairman in Mrs Newall and Mrs Frances Charlton. Over the 90 years our WI have taken part in many many events in the area and are happy to be still active in the region and especially to be part of the Stanegate Festival events again this year. We meet every second Thursday in the Town Hall at 7 p.m. and any lady interested would be made very welcome.